Recently, we’ve had customers who use the TSI Portacount respirator fit test system ask us how to generate reports for both passed and failed fit tests. By default, both the Portacount and the compatible FitPro software only store passed fit tests to the database. But you can change that default setting to store both passed and failed fit tests. Please note: This change needs to be made to the database before you start testing. Otherwise, the failed tests will be discarded. If you're working with a TSI Portacount Pro 8030 or Pro+ 8038 model directly connected to a USB printer, you can change the database behavior there. On the Portacount screen, click on the Setup tab, then Global Settings. There's a drop-down menu labeled "Save fit test to database." 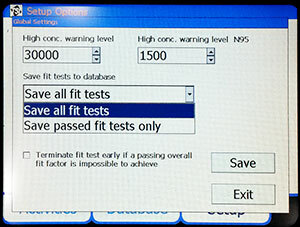 From the drop-down, choose "Save all fit tests", then [Save] and [Exit]. If you're working with your PC and TSI FitPro software, here's how you change the setting: Launch FitPro software and select Setup from the menu, then Global FitPro Options. 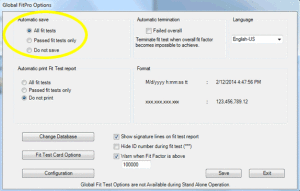 Click the radio button under automatic save from "Passed Fit Tests Only" to the "All Fit Tests" option. Select “Create New Report” and give your customer report a title. Click [Next]. Now, you select a table for the report data. Choose Fittest. Click [Next]. Next, you’ll select the fields you would show in the report. Select LASTNAME, FIRSTNAME, and OVERALLPASS. Click [Next]. Click [NEXT] on the next two screens, and your custom report will show up among the report selections. Test your custom report. Select it and click on “View Report” to see the results. Why would you want to see people who failed the fit test? One customer mentioned that he was using the data to find out which members of his team he’d have to retest at a later date. Another, a contractor, talked about using the report for billing purposes. Since he charges for his service based on the number of fit tests run, not just the number of passed fit tests, it’s important to him to show exactly how many tests were run, regardless of the outcome. Want to learn more about the TSI Portacount Pro fit test system? Get the specs and datasheet, or check our training center for nearly three hours of fit testing video training from TSI.